First, a primer on how to pronounce “Schmaderer,” the new police chief’s last name: “SHMA’ der.” Rhymes with water. “Some of our relatives actually dropped the last ‘er,’” he explained during an hour-long interview with The Reader. Water is an apt metaphor for Todd Schmaderer’s thoughtful, soft-spoken demeanor. 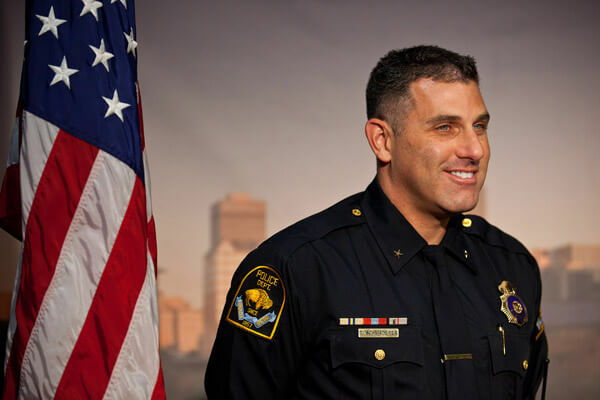 Still waters run deep and so does Omaha’s 40-year old police chief. Schmaderer has a diverse skill set. He is a law enforcement practitioner with 16 years experience on the force in numerous supervisory positions and departments. He has a Bachelors degree in criminology from UNO and earned a Masters degree online from the University of Cincinnati. He taught college courses at ITT Tech and supervised Omaha’s police academy for three years during the city’s busiest hiring period. Schmaderer supervised five classes in those three years, training 200 recruits — one quarter of the current force of 800 uniform officers. Just three weeks into his tenure, Schmaderer has been busy meeting with citizens and neighborhood groups. Last Saturday, he spent the morning at North High attending a “Raise The Vote” summit hosted by the Empowerment Network. After a powerpoint presentation by network president Willie Barney on the decrease in gun violence and homicides over the past five years, Schmaderer made a brief speech to the crowd. He drew attention to the fatigue on his face. The night before there were five shootings in north Omaha, including one fatality. Schmaderer acknowledged that there is more work to be done to decrease gun violence, but he encouraged the audience not to lose sight of the big picture. “Omaha is a wonderful place to live. If you look at Omaha — we’re about 450,000 people — and compare us to any other city our size in the country, you’ll want to live here above all those other cities,” he said. Schmaderer was aware of allegations in the recent gang assessment that officers were transporting gang members to rival territories and dropping them off. He said he had addressed the officers twice since taking office and would not tolerate that kind of conduct from them. When asked about the lack of a police auditor, Schmaderer said he believes civilian oversight of the police promotes trust and can be accomplished by either a police auditor or a civilian review board. Asked about diversity, he said the police department should reflect the demographics of the community it serves and he plans to promote diversity in the ranks. Even mundane things like redesigning the police department website are on the new chief’s radar. Members of the public with web design experience are welcome to help with that project. Citizens or groups who want to meet with the police chief can contact OpdPublicInformation@ci.omaha.ne.us.